Robert Irving, III, a.k.a. "Baabe" (pronounced like Bobby), is best known for his five year tenure as Musical Director, Producer, and Keyboardist for the legendary Miles Davis. Baabe, as he is known by his peers, has produced three Grammy Award nominated albums- two for Miles, “Decoy” and “You're Under Arrest” and one entitled “Real Life Story”, the Polygram debut for drummer, Terri Lyne Carrington. Baabe has produced recordings with Sting, Carlos Santana, Dianne Reeves, Branford Marsalis, Wayne Shorter, Bill Evans, Gerald Albright, Grover Washington, Patrice Rushen, John Scofield, David Murray and numerous other world-class musicians. Baabe also produced the Susan Osborn, Nippon Music Award winning CD, “Wabi” released in Japan on NEC Avenue. As a composer, keyboardist, and arranger, Irving contributed to three Ramsey Lewis albums, “Three Piece Suite,” “Live at the Savoy,” and “Chance Encounters” and has also contributed to numerous other projects and live performances with artists: David Murray, Oliver Lake, Billy Joel, Oscar Brown Jr., Michael Brecker, Marcus Miller, Wallace Roney, Buster Williams, Phil Upchurch, Darryl Jones, Victor Bailey, Pharaoh Sanders, Fred White (Earth Wind & Fire) Phil Perry, Marilyn Mazure, harpist, Markus Klinko, Ray Parker Jr. and was the musical director for Sister Sledge. Baabe is featured on the recent CD release, “Dark Star” with the David Murray Octafunk group on Profile Records which rose to #1 on the billboard jazz charts). Baabe’s work can be heard on 22 CDs. Irving has composed and produced four film/television scores. They are “Street Smart” for Cannon Films, directed by Jerry Shatsberg, featuring Christopher Reeve and Morgan Freeman, Alfred Hitchcock Presents, “The Prisoners,” starring Yaphett Koto for MCA/Universal Studios, directed by Drew Merish, and a short subject film entitled, “David and Michael at the Beach” by director, Martin Hudson. Baabe’s most recent score is for a feature length film entitled “Scenes For The Soul,” a trilogy directed by George Tilman (Soul Food) for Menagerie Films. 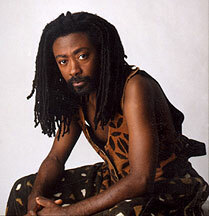 David Murray and Baabe conducted extensive music workshops in Paris, France, Dakar Senegal and Martinique, West Indies. A recording project in Dakar yielded the CD “Fo Duek Review”, released last spring on Justin Records/Enja Records with three compositions by Irving. Baabe currently tours with Warner Bros. recording artist, trumpeter, Wallace Roney in support of the latter’s new CD “Village” on which Irving is a guest musician/arranger on five tracks along with Chick Corea, Gerri Allen, Lenny White and Pharaoh Sanders. In Chicago he leads his own groups “School of Cool” and is founder and director of the sixteen piece, “African Arts Ensemble”. As a visual artist Baabe has been painting since April 1997 and has exhibited at the Hot House Club/Exhibition Center in downtown Chicago, The African Festival of the Arts and exhibits, on-going, at his beach side “Spirit Art” Studio and at the Corridor Gallery in New York. His group “Visual Music” debuted in September 1998 as a group of performing visual artists.